Masterfully still life was executed by renowed French painter Georges Jeannin (1841–1925). Americans traveled to Paris to study with Geroges Jeannin. Among them were the great American flower painter Abbott Fuller Graves who traveled back and forth to continue studying with Georges Jeannin. Julia Dillon, a Kingston, New York artist studied with him. 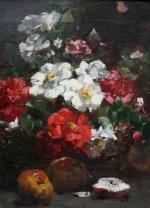 Georges Jeannin was considered to be the foremost flower painter in Europe. 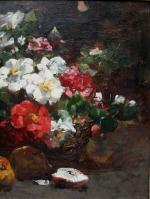 In the 1860’s and 70’s the Impressionists made a name for themselves by focusing on everyday life for subject matter. This influenced artists throughout France. Georges Jeannin was interested in depicting modern life, including scenes of embarkation, holidays and the market. His work was especially admired by Vincent Van Gogh. In 1878 he joined the Societaire des Artistes Francais Jeannin’s works have been conserved in museums throughout France. Literature: E. Benezit " Dictionary of painters, sculptors, decorators and etchers"(in French), Paris, 1999; Thieme/Becker, Leipzig,1999. Condition: in good condition, original canvas professional was restored and cleaned.